Cormac Costello and Sean O’Shea have been in good form so far in the league. Cormac Costello and Sean O'Shea could star in attack for their respective sides tonight. TWO MEN WORTH keeping a close eye on in tonight’s big clash at Austin Stack Park are likely to be playing in the number 11 position. Sean O’Shea has started the league on fire, running up some eye-catching tallies in the opening two rounds as the Kingdom surged to the top of the Division 1 table. He’s named to start at centre-forward, the same position Cormac Costello - fresh from his six-point haul against Galway – is expected to occupy. Peter Keane meets Jim Gavin on the sideline for the first time tonight, just a few short months into his first campaign as senior boss. It’s been a bright start for the Munster champions under their new manager. They had four points to spare against a Tyrone team that featured nine of their All-Ireland final side, while the three-point defeat of Cavan was achieved after a strong final quarter. Kerry have adopted a more defensive approach under Keane, but he has been afforded the sort of patience that a new manager generally gets in the early days. Dublin will bring an entirely different challenge this evening through, and the honeymoon period could soon wear off if Kerry are subjected to a heavy beating. The last meeting between these sides in Tralee was an eventful one. Dublin arrived down in March 2017 requiring a draw to extend their unbeaten run across league and championship to a record-equaling 34 games. The All-Ireland champions were trailing by a point when, in a frantic finish, Paul Mannion kicked a 74th minute equaliser after a Paul Murphy free on the half-back line went astray and the hosts were duly punished. Kerry did manage to beat Dublin the following month in the league final, but they didn’t clash in the championship that summer. Mayo overcame Kerry after a replay in the All-Ireland semi-final, denying the Kingdom and Fitzmaurice a chance to claim back-to-back victories over Dublin. The team Keane named shows just six survivors from that night in Tralee two years ago: Peter Crowley, Tadhg Morley, Jack Barry, Adrian Spillane, Paul Murphy and Paul Geaney. The Dublin side also sees six players retained from that clash two years ago: Michael Fitzsimons, John Small, Eric Lowndes, Brian Fenton, Niall Scully and Dean Rock. One significant newcomer in the Kerry line-up is O’Shea, who is currently the second-highest scorer across the four divisions with 0-18 to his name. O’Shea is well acquainted with Keane – the pair won two All-Ireland minor titles together in 2015 and 2016. The Kenmare youngster’s debut campaign last year was somewhat overshadowed by David Clifford’s stunning breakthrough season. Clifford, a minor sensation in 2017, delivered during his senior bow and was deservedly named Young Footballer of the Year while also claiming his first All-Star. But O’Shea’s impressive introduction to the top-level flew under the radar somewhat, despite giving the impression that he may be the long-term answer at centre-forward. With Clifford currently sidelined with a shoulder injury, O’Shea looks intent on taking his game to new levels in 2019. The 18 points he’s posted in the league has complimented his fine form for UCC in the Sigerson Cup. The Cork college booked their place in the semi-finals on Wednesday night, boosted by a seven-point haul from O’Shea who pulled the strings from centre-forward. O’Shea’s reliability from placed balls is another huge string to his bow. He looks capable of filling the free-taking void left by Bryan Sheehan’s retirement at the end of 2017. O’Shea’s score directly from a sideline against Tyrone wouldn’t have looked out of place in a Maurice Fitzgerald highlight reel. Working alongside the legendary forward in the Kerry set-up looks to be really benefiting O’Shea’s development into an elite forward. Playing in the heart of the blue attack will probably be Whitehall Colmcilles man Costello, who is similarly capable of scoring off either foot and at free-taking. His display against the Tribesmen at HQ a week ago reminded the country of Costello’s immense ability when he is fit. His talent has never been in doubt, but the problem for Costello has been getting onto the field. As a 22-year-old he had a dream impact off the bench in the 2016 All-Ireland final, clipping over three points from play against Mayo to finish as the game’s joint-top scorer from play. But he was robbed of the chance to build on that promise by tearing his hamstring three times in 2017. He scored 0-18 across five games in last year’s championship but started just once – in a Super 8s dead rubber against Roscommon. Niall Scully and Brian Howard have leapfrogged ahead of Costello in the pecking order, although he replaced the former 52 minutes into the final against Tyrone. Costello’s only other championship start for the Sky Blues was in the 2014 All-Ireland semi-final loss to Donegal. He doesn’t turn 25 until July, but the talented attacker will be keen to make up for lost time and stamp down a place in the forward line this year. Jim Gavin has a habit of rewarding strong performers in the league with championship starting places. If Costello can continue his scoring form he’ll do his chances of breaking into the first 15 no harm, but it’s difficult to see where he could fit into the star-studded attack. Rock, Paul Mannion and Con O’Callaghan remain Gavin’s first choice full-forward line, while the half-forward trio of Howard-Ciaran Kilkenny-Scully has a formidable look to it. Perhaps Howard could drop to midfield or Scully to wing-back to accommodate Costello, but it’s more likely Gavin will look to use him as an impact substitute for their five-in-a-row bid. All Costello can do is continue to give his manager food for thought with impactful performances throughout the league in his attempt to cement a starting place in the team. It would be no surprise to see either O’Shea or Costello – or both – shoot the lights out in Tralee tonight. Elsewhere there will be plenty of shadow-boxing taking place with neither Keane nor Gavin willing to show their hand too early in the year. Email “All eyes on in-form centre-forwards for tonight's big Kerry-Dublin showdown”. 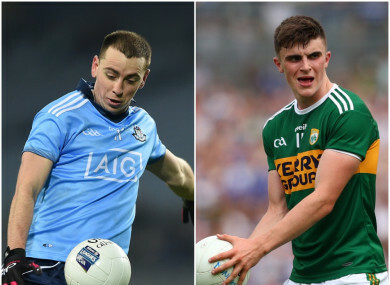 Feedback on “All eyes on in-form centre-forwards for tonight's big Kerry-Dublin showdown”.